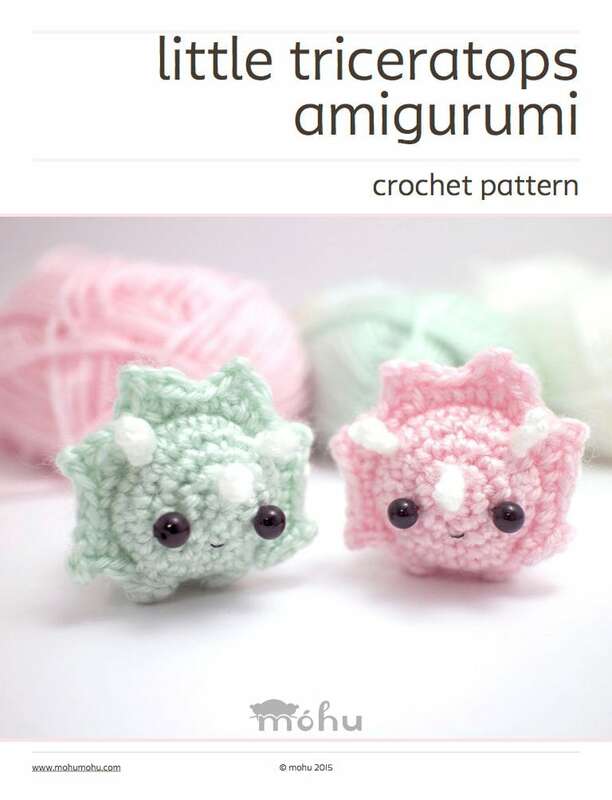 A downloadable crochet pattern for a cute amigurumi triceratops. 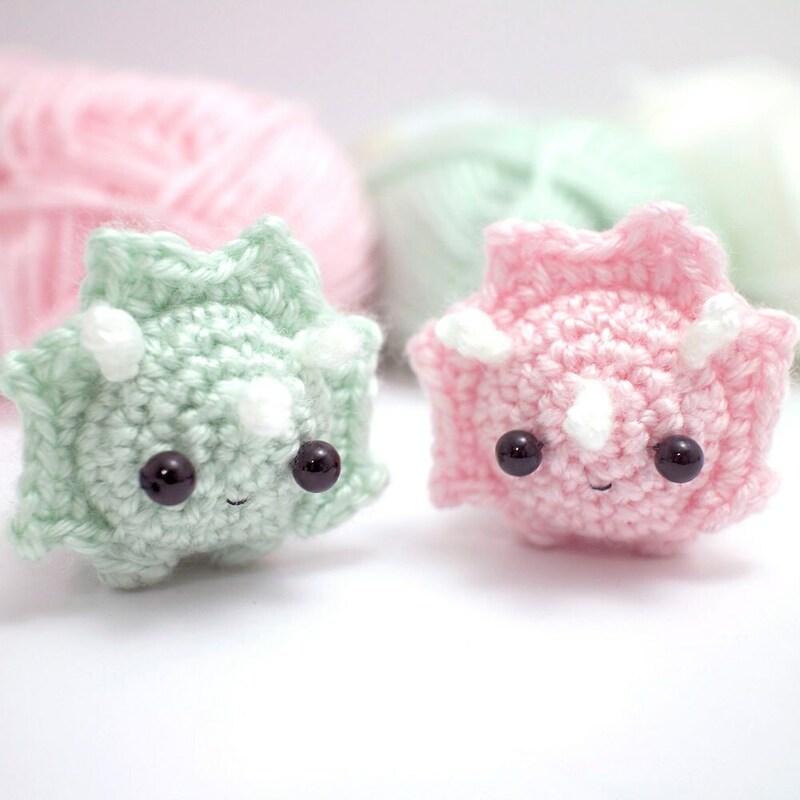 The pdf file contains a written crochet pattern, an extra crochet chart for the triceratops frills, detailed assembly instructions, and lots of photos. 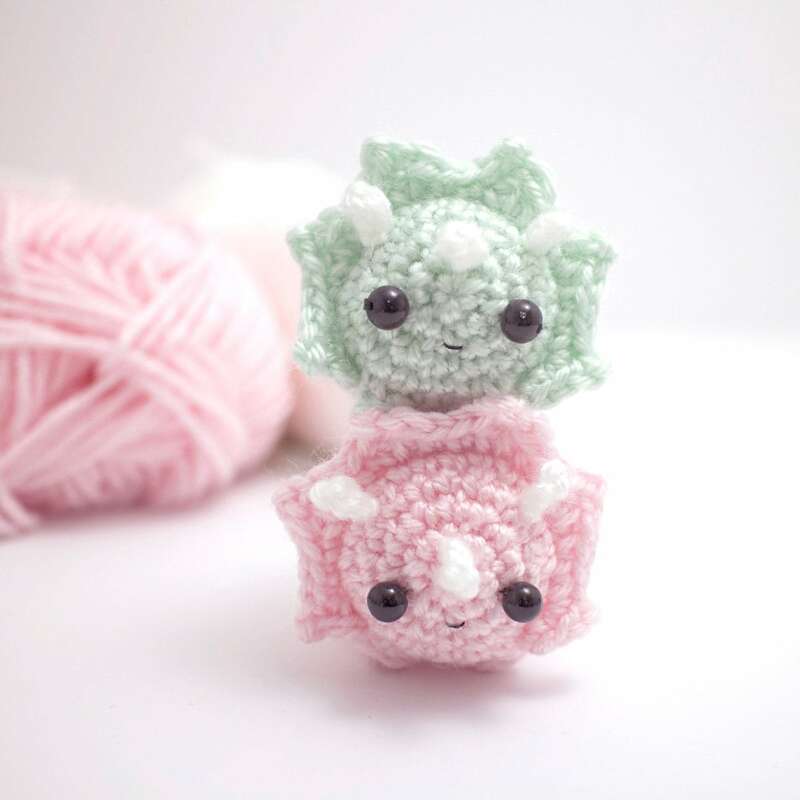 The crochet triceratops is quite simple to make, although the details require a little bit of skill. You will need basic knowledge of crochet stitches and working in the round. The pattern is written using US crochet terms, and uses single crochet, half double crochet, double crochet, and picot stitches. These techniques are taught in the beginner's crochet guide, included in your purchase. The example uses medium weight (worsted weight) yarn and a 3.5 mm (E) crochet hook to make an amigurumi that is about 5 cm / 2" long and 4 cm / 1.6" wide. You can easily substitute thicker or thinner yarn for a different size. You'll need small amounts of worsted weight yarn in a main colour, and a little bit of white. You also need some stuffing, 6mm black beads for eyes, and black thread for sewing. A 3.5 mm (E) crochet hook and sewing needles are used. Móhu's patterns are intended for personal use. You may use the patterns to make items for yourself, as gifts, or for charity. Please don't distribute the files that you have purchased, whether in digital or physical form. When you buy a digital pattern, you're not buying the rights to the design. Once you purchase the pattern, you'll be able to download it directly from your Etsy account. If you need any help, you can contact me here on Etsy or by email. Such a cute pattern! Once again, super clear photos showing what the pieces should look like, and a chart to show exactly how the "frill" is made. I cant wait to make an army of these little amigurumis!